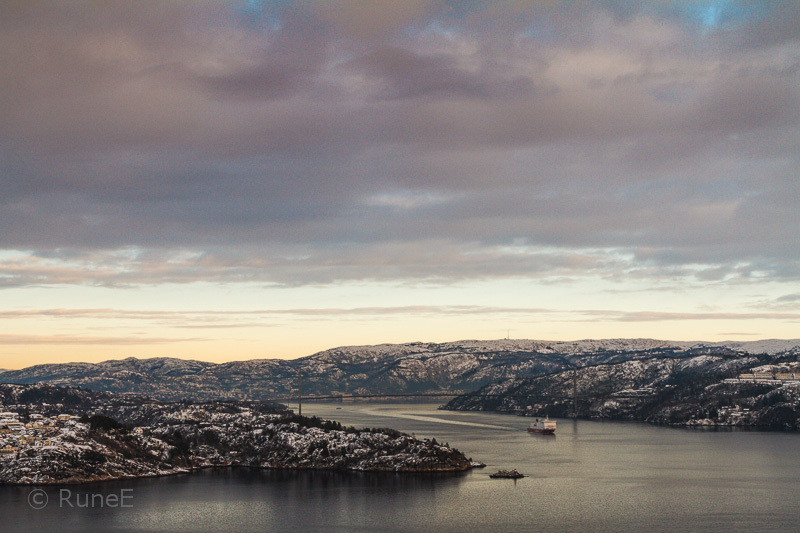 Winter has come to the fjords. 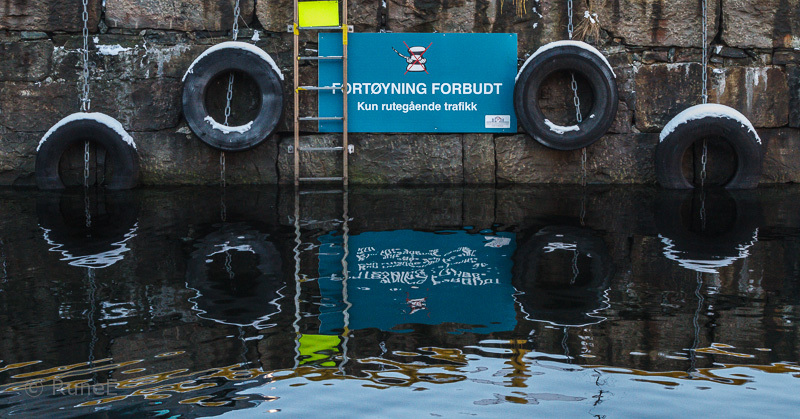 And to the harbour (and if you wonder about the sign, it says "Mooring forbidden - passenger traffic only"). 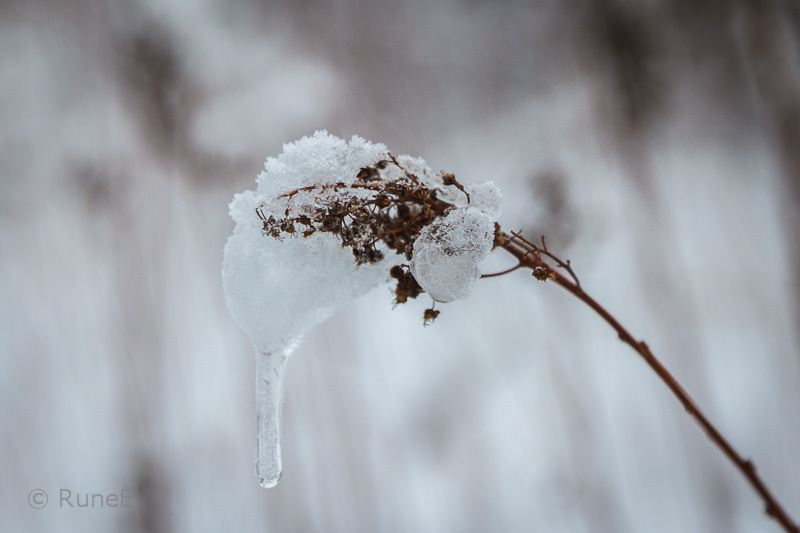 In the fields you might spot a frozen straw - or perhaps a swan? 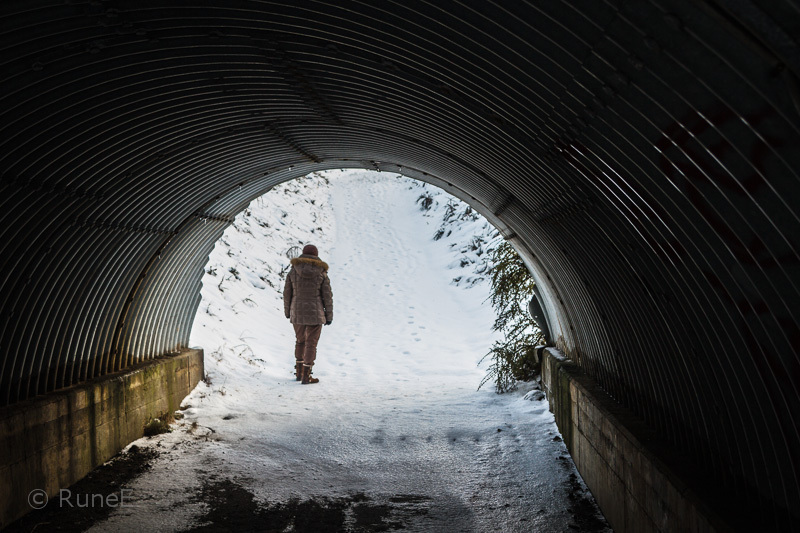 And with the snow you might prefer to use a tunnel. Det ser ut som om dere har fått mere snø enn oss. Vi har hatt dett iskaldt med temp ned mot -17 her i Trondheim. I love your glimpses of winter, Rune!! And, yes, I do think I see a swan -- a very cold one! It looks just about as gray here in Seattle, but certainly not as cold! Hope you have a great week! Stay warm! Snow! I miss it so. Wish I could be walking out of that tunnel now. A fine assortment of pictures to make us feel the atmosphere there. I think I'd be worried about the walk out of the tunnel which might be too icy to climb out of. Lovely shots though. We don't have snow here in the winter, so you know how much I enjoy the snow in your photos...snow and ice...beautiful! Likte så bildet ditt av den frosne blomsten med den hengende istappen på, symbolsk og et bilde som gikk litt i sjela mi. Fin fin førjulsuke til deg gutten. Anneklem. Brrr! It makes me cold just to see it. We have no snow yet in Oklahoma but temperatures well below freezing at night. The cool, grey tones of winter...a lovely contrast to our lime-green, fuschia colors of Florida. Twelve inches of snow fell on my brother's house in Minnesota so I'm seeing white, white, white in his pictures. So familiar and magical...and so dangerous. 600 car accidents within hours. I really like the harbour shot, especially with the snow coating the 'bumpers'. Do you hear my big sigh?.. Your first picture is soooooo beautyful! The light is spectacular! You have way more snow than we have at the moment. ah, winter... a beautiful season! Thank you for your comment on my Vision and Verb post. I also like reading books in their English original but that's not easy and takes more time to me. And the other languages... many times one needs to get by with the translation. What beauty you capture my friend. Marvelous photos as always, Rune. Thanks for translating that sign...I was wondering. Forbidden and traffic I could guess, but not the other words. The tunnel...I can imagine the crunch of snow underfoot as one walks along that cold, cold pathway. I still love your shots of the water, both close and from afar! We have had a few nights below freezing, but with mosture from the sky. From the foot prints in the snow, I guess the path is very walkable. Winter Wonderland i Bergen! Flotte bilder (det er forresten bildene under fra London også). Mer snø i vente, jeg rømmer landet for noen dager og håper jeg slipper unna! As I've probably said before, I envy you your hills, but not your darkness. I'd like having transparent tunnels for seeing the snow but not having to slog through it. Maybe in another universe? We now have a similar sprinkling of snow, which arrived while we were Christmas shopping yesterday. Snow uh. Wonderful I love it. And you're pictures again are beautiful, great composure. Wish you a Merry Christmas from Italy. Fantastisk fine og forskellige vinter billeder, Rune. I did enjoy the picture of the fjords. It truly does look as if winter has made it to your side of the world and it makes me cold just to look at these pictures. There is a certain beauty though, when winter comes. I like looking at snow, but had enough of it when I lived in Idaho to last me the rest of my life. That is a really interesting shot of the tunnel, going from dark to light. I have to admit I had a little problem figuring out the second photo, I think it was. It took me a little while before I realized that what I was seeing was a reflection oh the sign on on the water, and what lookd like tires on the bottom. I'm glad you translated the sign. It helped. I don't know where in the world you find such interesting shots, Rune. You must do a lot of hiking around. Of course that is wonderful exercise and I wish I could do a little more walking. I find it easier to walk than just stand still though, but unfortunately I'll have to leave the walking up to you young follks. Thanks for wonderul pictures again, Rune. Lovely photos for the time of year. Alas, in Toronto I've seen a bare layer of snow that melted quickly; although to the north and west there was more. I expect a large downfall will occur soon enough.